This deceptively simple wording is leaving Ontarians without proper nutrition. First names used by request. Like many Ontarians in recent years Toronto area couple Terri & Adam have fallen on hard times. When their daughter was diagnosed with severe allergies shortly after birth they thought that the Ontario health care system would provide the necessities of life. What they have found instead is a tangled web of forms and red tape. While still at the hospital their newborn daughter was added to the Ontario Drug Benefit (ODB) to receive nutritional supplements. Her allergies were more severe than most cases and she could not even tolerate certain brands of hypoallergenic formula. The only brand that she can tolerate is Neocate which is made by Numico, a subsidiary of Groupe Danone. Neocate can be purchased over the counter at pharmacies for $1200 for a 1 month supply. A similar formula that she could not tolerate retails for approximately $900 for a 1 month supply. According to ODB the cost to the retailer for these products is roughly half what they are sold for. Upon release from the hospital they had to re-add their daughter to the ODB as she was no longer under the care of the hospital's dietician. After seeing their pediatrician they were added to the ODB with a form good for 1 year. Once this form had expired they returned to their pediatrician for a new form. This when things took a big left turn. 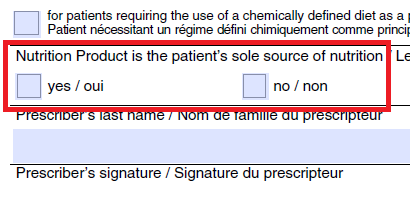 The wording on the form states that in order to be eligible the product must be their "sole source of nutrition". At this point their daughter could eat some solid food so their doctor indicated on the form that, no, it was not her sole source of nutrition. She was taken off the ODB nutrition benefit leaving her parents unable to afford the formula. Neocate contains all of the carbohydrates, proteins, fats, vitamins and minerals that their daughter cannot get anywhere else. Any meal or snack that would normally be made with milk must be made with Neocate; cereals, breads, granola bars all must be homemade. While rice milk is also hypoallergenic it contains virtually no nutrition for a growing child and certainly none of the proteins and carbohydrates that she needs. They received a runaround from the pharmacist to the doctor and back with the pharmacist claiming that the doctor could just change the form and the doctor refusing to do so. Terri & Adam have contacted several groups seeking assistance including Healthy Babies, Health Children, the Ministry of Health and their local Liberal MPP. They have even contacted Numico to enquire about a compassionate program. Through their quest they have come to realize that they are not the only family suffering in this way. They were adamant that even when their situation is resolved to their satisfaction the system must change and that no other family should have to share their ordeal.